1. V. Fiere, S. Fuentes, E. Burger, T. Raabe, P. Passias, et al. Patient-Specific Rods show a reduction in rod breakage incidence. Medicrea Whitepaper. October 2017. 2. Hamilton DK, Buza JA, Passias PG, et al. 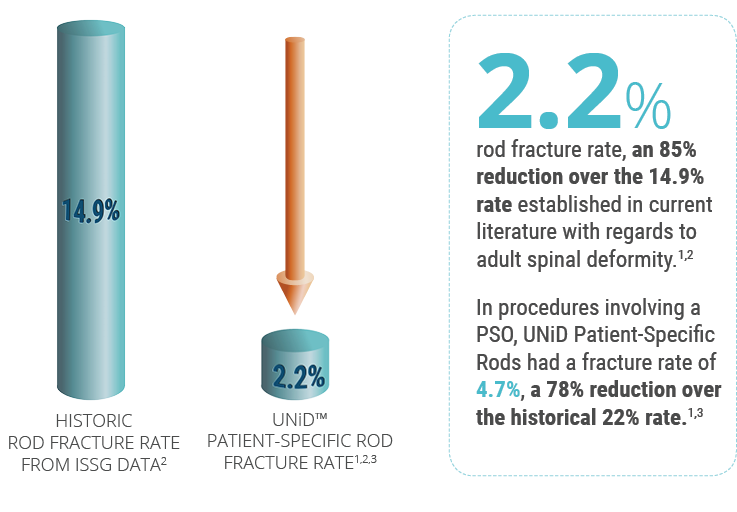 The Fate of Adult Spinal Deformity (ASD) Patients Incurring Rod Fracture After Thoracolumbar Fusion. World Neurosurgery. 2017. 3. Smith JS, Shaffrey CI, Klineberg E, et al. Prospective multicenter assessment of risk factors for rod fracture following surgery for adult spinal deformity. J Neurosurg Spine 21:994–1003, 2014. Vous accédez maintenant au domaine réservé aux professionnels de la santé du site internet Medicrea.